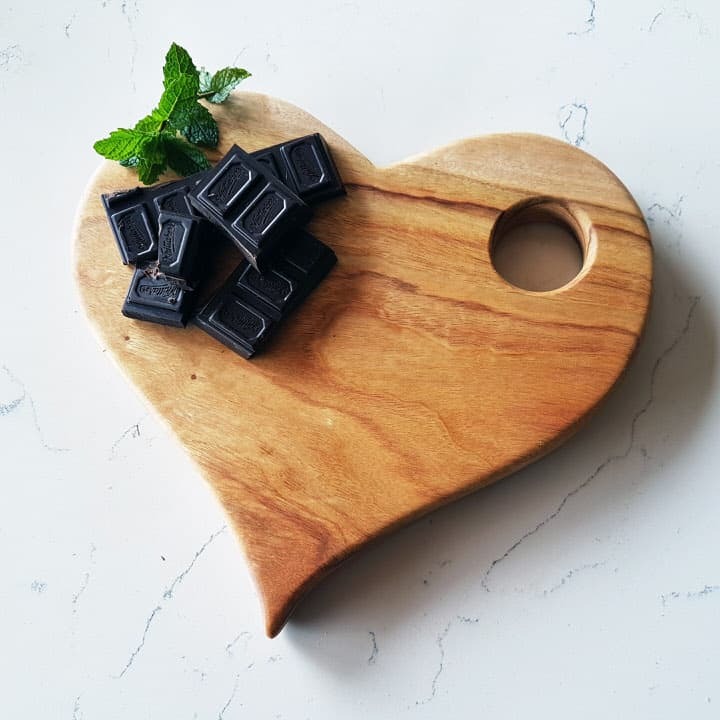 The best gifts are the ones that are as unique as the individual receiving it. 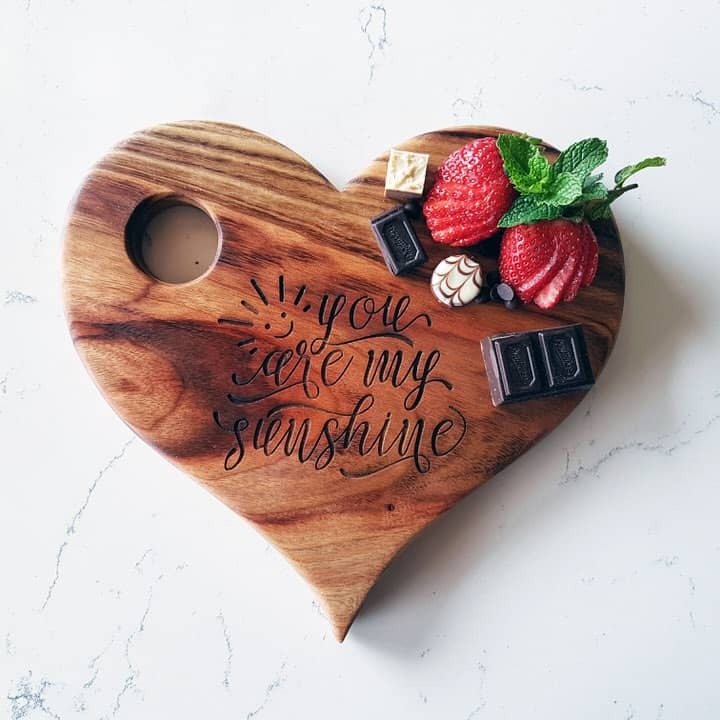 Gift the kitchen wizard love of your life a personalised heart-shaped wooden serving board that would make him or her smile every time they are creating in the kitchen. 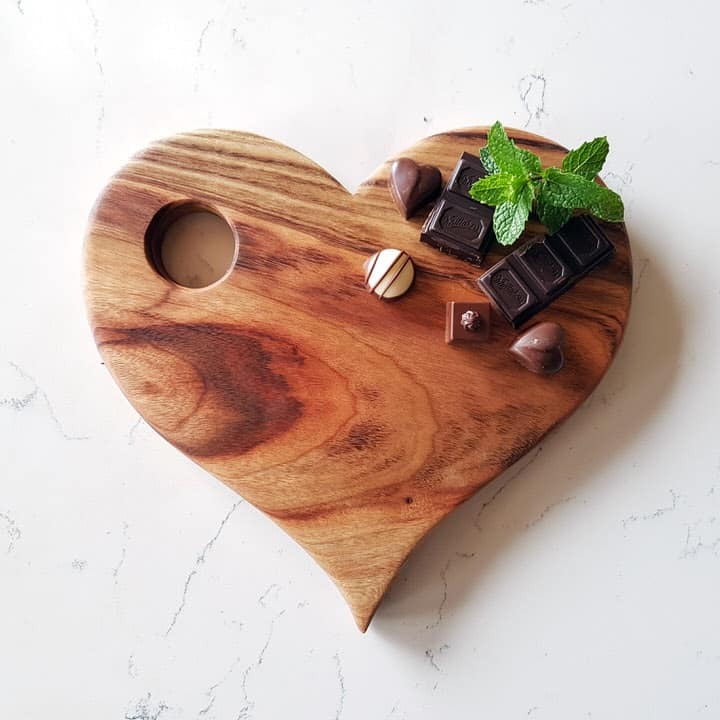 These beautiful boards can be used as a cheese platter, dessert server or decorative piece in the home. Make it an extra special gift by pairing your board with a set of charming glassware for the champagne lover to the whiskey fan from our specially curated collection. 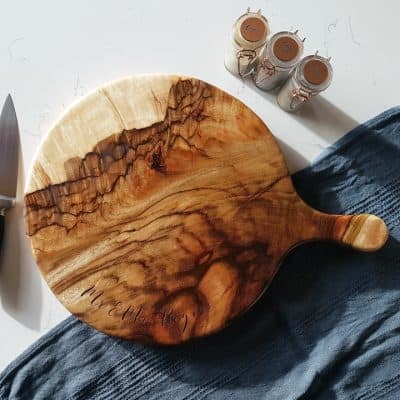 Handcrafted from beautiful Camphor Laurel timber sourced from Northern NSW. 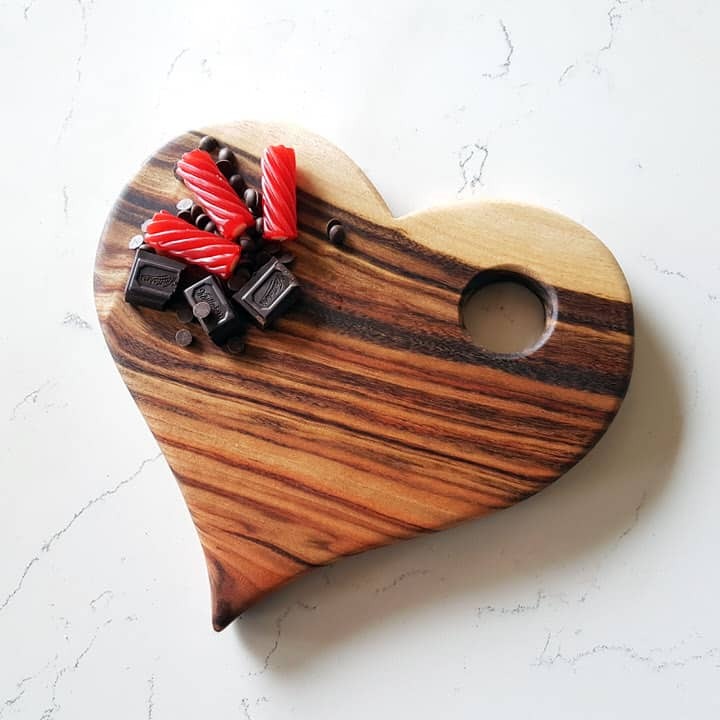 We carefully select only the most beautiful, interesting and unique pieces to make our boards from. 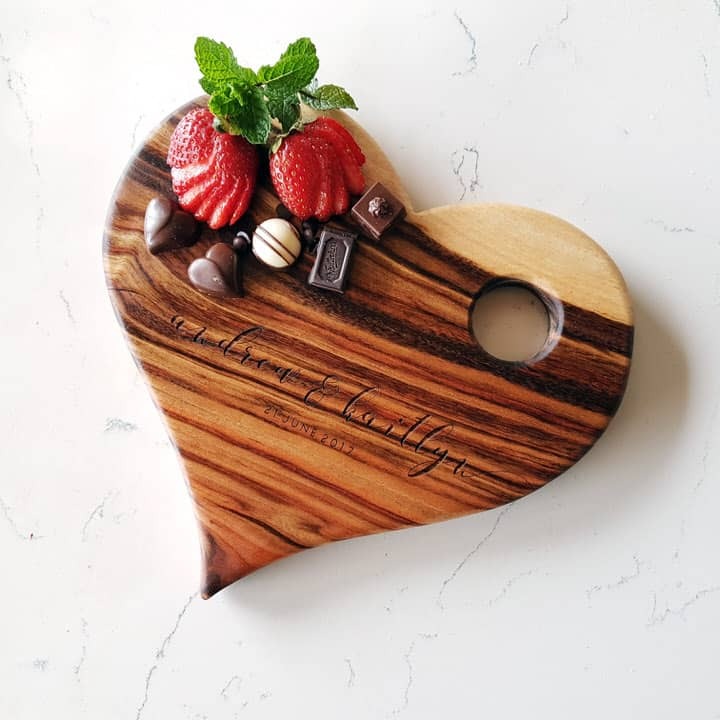 If you would like for your board to be engraved, please let us know if you would like to include name or a 1-2 line personalised message in the order notes in checkout. To ensure that you’re happy with your text and its positioning, we always send a proof prior to production. *The boards in the photos are examples only – unless otherwise stated, every board is different in colour and shape. Production time is approximately 1-2 weeks from receipt of payment. For guaranteed Valentine’s Day delivery, please place your orders by the 6 Feb.
Read more about Wildfire Engraving here. Shipping Costs: Standard delivery to major areas: $10 Single flat fee Australia wide. Standard is 5 - 10 business days (depending on location) If you would like to organise your own courier collection or personal collection please let us know and we will accommodate your request. For over sized items or large quantities delivery costs will be quoted. Wildfire Engraving can not be held accountable for any inconveniences that occur due to delivery drivers making errors and/or showing up on a different day to the expected delivery day. Exact delivery times are difficult to discern but Wildfire Engraving can provide an estimated time of delivery on request, based on the information given to them from the courier company. Your satisfaction is very important to us. If you have an issue with the product received, please contact us (Ph: 0434 813 083 Email: hello@wildfireengraving.com.au) within 7 days of receiving your item(s) to initiate the returns process. If the goods are faulty, 100% refund will be processed, however if you have changed your mind we will issue a refund once you have sent the item back to us, in original condition, at your own cost.